Storm on Saturn by Cassini from NASA/JPL/Space Science Institute. 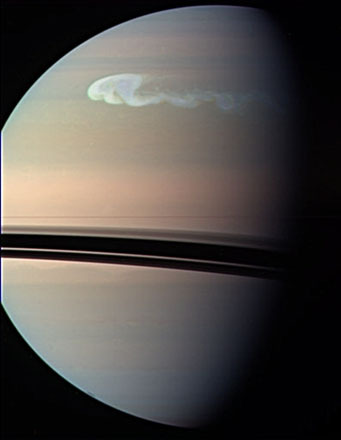 There is a gigantic beautiful storm on Saturn, noticeable through amateur telescopes, but even more spectacular through Cassini’s instruments. It’s new – discovered in early December 2010. You can see Saturn early in the morning right now. There’s not that much to be said for this storm at the moment, though it is so cool I’m surprised to find so few articles about it. It was discovered by amateurs, and Cassini just happened to be in the right place to take a picture on December 24 (2010). That doesn’t leave time for analysis, what with holiday breaks, and the American Astronomical Society Conference starting today in Seattle. At this point it is reasonable to compare this storm to others in the Solar System – hurricanes on Earth, Jupiter’s Great Red Spot, and the storm on Neptune. I can’t say which ones are actually related types of storms, but they’re definitely all atmospheric events for their respective planets. Gases have this habit of not staying in one place, they get stirred up, mixed up, blown around. They rise and sink, move as large masses, or blend into the surrounding materials. The storm is still developing – and to help you get a handle on visualizing how big this storm on Saturn is, I cobbled together a terrible-looking scaled image of Jupiter and Saturn, including Jupiter’s Red Spot and Saturn’s new storm. This is generally to scale, I did measure rather than just eyeballing, but I didn’t have the computer scale it for me or anything that sophisticated. Sorry, I know it is ugly, but I thought it would be useful. 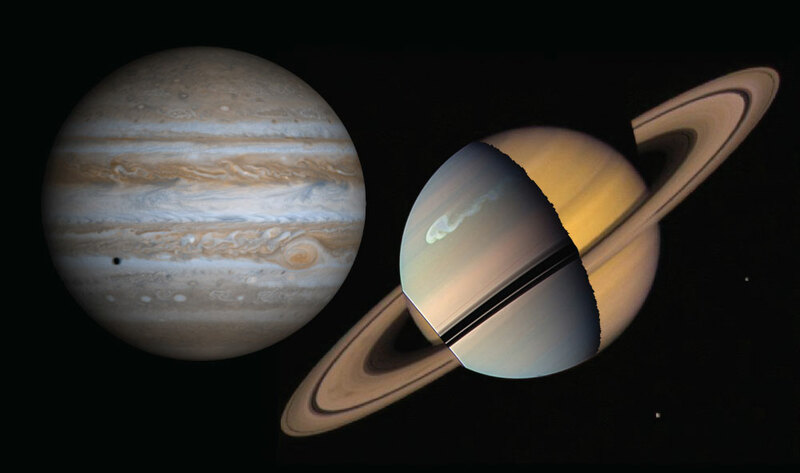 As you can see, the storms are comparably sized, with Saturn’s being a little smaller and longer. Both Jupiter and Saturn are easily visible in tonight’s sky – Jupiter after sunset, high in the West, and Saturn a bit before sunrise, midway up in the East. So, depending on if you’re an early riser or a night owl (who stays up past 5pm here in the winter …) – you can see at least one of the gas giants tonight. Yes, even from Seattle! Take your chances when there’s a little gap in the clouds and look!